What’s the Future of B2B Marketing? It’s the time of year when predictions for the next year start to populate the airwaves. 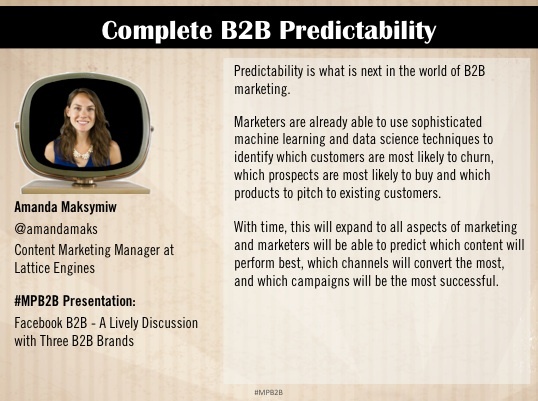 In preparation for the MarketingProf’s annual B2B event in Boston, TopRank’s Lee Odden pooled together a collection of #MPB2B speakers to share their predictions for the future of marketing. The ebook contains predictions from some of the marketing greats including Ann Handley, Jon Miller, Jason Miller, Christopher Penn, Doug Kessler and more. In fact, here is a quick look at my prediction. There are plenty of other insights and opinions in the ebook, but don’t take my word for it! Be sure to check it out for yourself! If you are attending the B2B Forum in October, keep an eye out for the Lattice marketing nerd herd and don’t forget to participate in our #MKTGnerd contest.